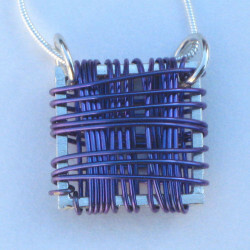 These are silver framed pendants – approx. 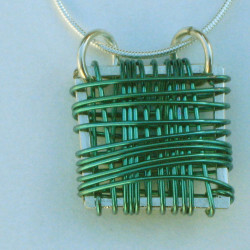 2.5cm wide – on 18″ silver snake chain wrapped with niobium wire. 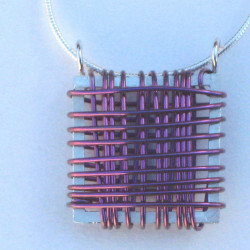 Niobium wire is anodised in a choice of Brown, Blue, Pink, Gold, Purple or Green then tension wrapped around the silver frame. Each piece is a one-off, made by hand and will be unique and individually manufactured to order. Colour may vary ever so slightly to the illustration due to the unpredictability of the metal. Please allow up to 21 days for delivery, but item could arrive much earlier. 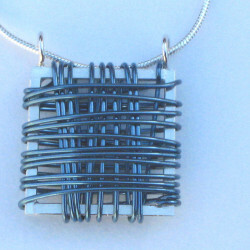 Blue Niobium & Silver Basket Pendant on 18” silver snake chain.